Link to Stonewall's website - Found via gsa_lj. I found this image on a group ( gsa_lj) I belong to here on LJ. 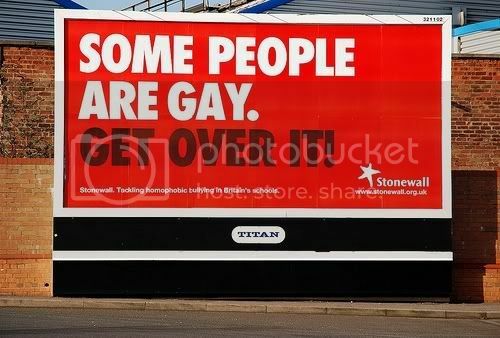 The billboard is part of a campaign called "Education for All" by a UK group named Stonewall. These billboards, 600 in all, are up all across England, Scotland, and Wales. I for one freaking love it! I think that it’s smashingly brilliant and would love to see these along every interstate, freeway, and highway here in the States. I really want to put one of these babies’s up in Topeka, KS, near everyone’s favorite wacko, Fred Phelps, and his Westboro Baptist Church. That and I want to get one on I-25 in the north end of Colorado Springs, right near the Focus on the Family sign. LOL. So come on, who is with me? Anyone want to split the cost of the billboard(s)? Anyone think Clear Channel Outdoor would donate the space to us? Yeah, what else can the Phelps clan do to Topeka? Might as well have done with them. When I drove thru Topeka back in early January it really did not seem to be too bad. I mean, yes, its Kansas, but over all really not too fundy or anything like that. But I must admit I think some payback against the Phelps clan would be very nice. I was going to say, most of the billboards are owned by Clear Channel, a very right-leaning organization...this would never happen here, heh. Very true about Clear Channel. But here in NM they really kinda seem to be liberal and I am not sure why. Also Clear Channel Outdoor was the first billboard company to come to mind since their New Mexico offices are the next building down from my office. So, what does this mean in English? And what kind of a timetable is there? In english, this means that key info about how some of Microsoft programs work will be published on the internet. This could be used to make non-Microsoft programs both online and offline work better with your Windows based computer. As for a timetable here, its anyones guess. Could be today, tomorrow, next week, or even next year. Its Microsoft. My best guess is it will be posted sooner then later as Microsoft is trying a hostle take over of internet giant Yahoo. They will need to prove that they are being more open and not a monolithic monopoly to get past US anti-trust regulations. Does it mean I don't need to buy XP to run on my Mac? Sadly, NO. It does not mean that Microsoft products are going free, it just means parts of the operating system and how they work are going to be documented on the internet. But...if someone recreates it and puts it online, doesn't that qualify as free? What Microsoft is going to put online will not be enough to recreate the whole operating system, or anything close to it. They would be stupid to as their bread and butter comes from the sale of operating systems like XP, Vista, and Server. Somethings, like the Xbox console for example, Microsoft looses money on, hoping to make it up on other things, like the sale of games for the Xbox. Someone a few years back did the math on how many Xbox consoles would have to be sold with no one buying any games to put Microsoft out of business.